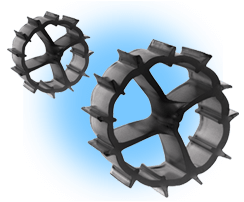 Wheel shaped random filter media with internal and external fins and surface area of 600m²/m³. The Biopipe is designed to provide a large protected surface area for the biofilm and optimal conditions for the bacteria culture when the media are suspended in water. A durable, rugged and highly efficient media for moving bed biological reactors (MBBR) and integrated fixed film activated sludge (IFAS) systems. Biopipe is ideal for MBBR industrial and municipal treatment plants where higher surface area is typically important. It is also designed for use in aquatic applications ranging from garden fishponds to large tanks.